Inch of Creativity: My Absolute Must Have! One of the hardest things to do when a new catalogue comes out, is narrowing down your wants and deciding what to order first! 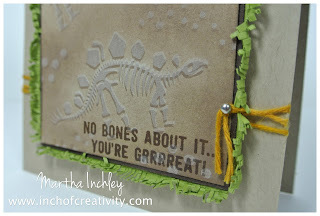 Well, no matter how many lists I made, the stamp set: No Bones About It, was always first! I LOVE IT! It has so much creative potential! Of course, having 2 boys, might have something to do with it too! I absolutely love today's card. When I was creating it, I had an excavation dig site in mind. I stamped each dinosaur and the "rock" spots in Crumb Cake ink onto Crumb Cake cardstock. Then I re-stamped everything in Whisper White Craft ink, but made sure to off set it just a tad. This gives the shadow effect. If you have an older, wonky Whisper White Craft pad like me, you might not be able to get an even distribution of ink on your stamped image. To get around this, apply the Whisper White Craft ink onto your stamp with a sponge dauber, it works like a charm! After everything dried, I sponge daubed the image with Crumb Cake ink and added in the greeting with Soft Suede ink. 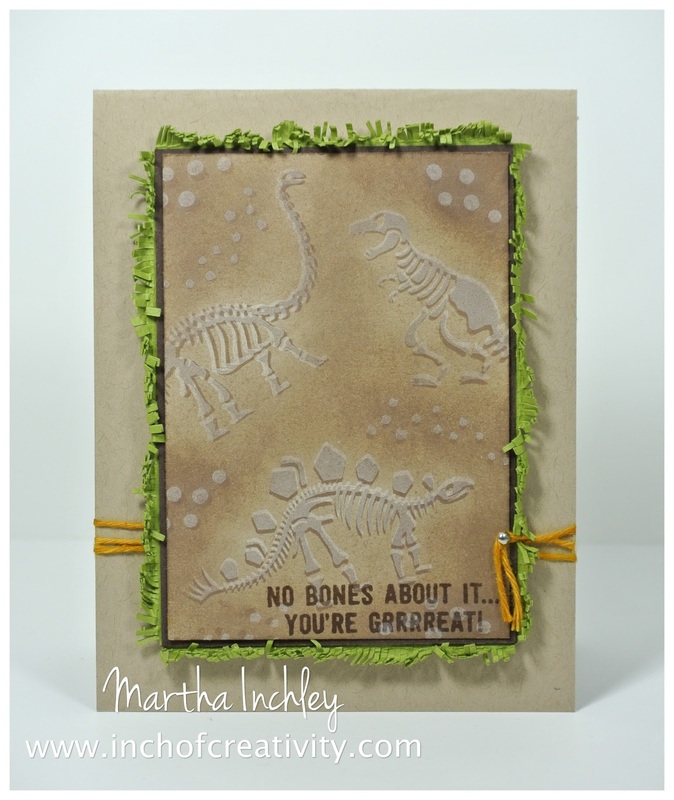 As I said previously, my inspiration for this card was a dig site. So for my border I create grass! I mounted my image on a large mat of Old Olive cardstock and then snipped all the way around. After it was all cut, I roughed it up: bending, rubbing, and crumpling it to the point that you could see the layers of paper start to separate. To finish it off, every dig site needs to be roped off, so I dyed some White Baker's Twine with Daffodil Delight Ink and tied it off! Thanks for stopping in and have a creative day! What a cool card! At first I thought it was embossed until I read the description of how you did it. Wow! I am so impressed. Thanks Gale! It does look like it's embossed, I love the shadow technique!